If you are interested in requesting membership to be included in The Alpha Group, then please fill in the information on the right side of the page. Here is a little more about us. Colin Lindsay is the International Managing Director of “The Alpha Group”. If you are interested in becoming a TAG Regional Director in your area please contact Colin via email and tell him you referred by The Alpha Group Sofia. Katrin Prentice is the First Bulgarian Accredited Master Coach by the International Institute of Coaching & Mentoring; Founder and President of the Sofia Coaching Community; Trainer, Mentor and Assessor on the Noble Manhattan Coaching Faculty; Managing Director of Noble Manhattan for Bulgaria, Greece and the Balkan Region. Katrin over 19 years experience as a coach, mentor and trainer to teams in the NGO sector in 9 countries of Eastern Europe, her personal and professional life has led through 22 different countries, giving her a wealth of experience working in an international and multicultural environment. Katrin specializes in personal and Executive coaching, human development, PR, crisis management, and organizational coaching. Brian Prentice is the CEO of Palitri International ltd,t/a Noble Manhattan Coaching for Bulgaria, Greece and the Balkan Region. He has a military background, after leaving the military he has had 7 years experience in the security and then customer relations field. He then started his 15 years experience in establishing and managing organizations both in the business and the non-profit sectors and conducting projects throughout south-east Europe. Dobrin Padalski has more than 15 years of business consulting experience across various organizations. He has assisted both SMEs and large corporations to achieve better results through improved organizational efficiency and increased personnel performance. His entrepreneurial record includes four start-ups, resulting in three sustainable businesses generating more than 1 million BGN turnover. As part of his consulting job, Dobrin has successfully worked, and continues working, with The Bulgarian Industrial Association, GlassCo (Bulgaria), FESTO Production (Bulgaria), MebelStil (Bulgaria), OSKAR-EL (Bulgaria), Mtel (Bulgaria), GLOBUL (Bulgaria), Banka DSK (Bulgaria), Nike EMEA (The Netherlands) and HTSPE Ltd. (UK) to name a few. Dobrin’s experience goes beyond the diagnostic and advisory role of a consultant. He often supports executives and managers to run in-house activities implementing sustainable changes. As a Regional Director of The Alpha Group in Sofia, Dobrin offers local SMEs the best possible support to dominate their market niche. During monthly advisory board meetings, he facilitates peer-to-peer exchange within the group of like-minded executives representing non-competing businesses. Dobrin’s mission within The Alpha Group is “To challenge and empower local SME leaders to reach ambitious goals and to make sustainable changes, internally from within, and in their interaction with associates”. 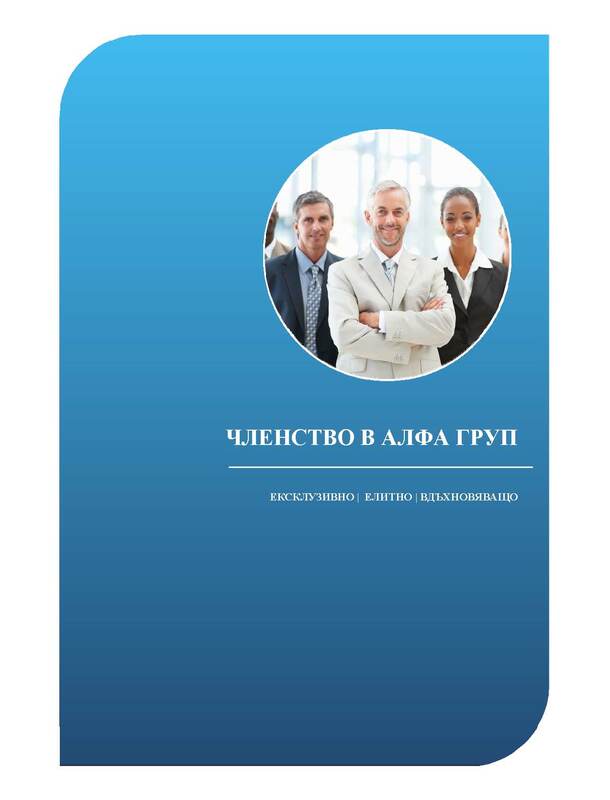 For any inquiries and further details about the benefits of the Alpha Group board advisory meetings, please contact Iliyan Kirkov at iliyan.kirkov@the-alpha-group.biz. Antonina Kardasheva, PhD, DSc is a Managing Director of SMART STRATEGIES Ltd. It is a consulting company that builds up old approaches and initiates new ones in the field of organizational and personal development. We have a different approach and innovative attitude to the people in the organization, family and personal relationships. As trusted corporate partner we offer SMART (Stable Management for Achieving Results in Teamwork) resistance management strategies that enhance the performance of the teams in organization. The team of the company works with companies and organizations whose priorities are to develop human resources and team interactions, leadership and organizational effectiveness. We support them in their understanding that investing in teamwork and individuality is the most efficient organizational strategy. That’s why we offer our clients to redefine and use ROI approach as “Return On the Individuality”. We believe that people can trust and feel inspired by their work – and then they are more creative and productive. We know that they actively seek the meaning of everything. They want to know who they are and how they can increase their personal effectiveness – and then they direct their emotional force, mental capacity and creative energy towards a permanent positive change in their personal, family and professional lives. As private consultant we offer strategies and methods to overcome difficulties and achieve goals. We do not use universal strategies for all organizations and people, and adapt them to individual needs. We can help people to become more flexible and adaptable in the workplace and to build harmonious relationships with their family and friends. Antonina finished PCD at Noble Manhattan as a Life and Executive Coach. She is psychologist and psychotherapist and researcher of Trait Emotional Intelligence. She tested and validated TEIQue as a method in Bulgarian populations. Antonina believes in Management through Emotional Intelligence because growing demands of the business environment and market insist on increasing ability and relevant leaders and managers’ personal traits. She knows that if leaders can manage in dynamic challenges, foster innovation, and build organizations where people develop their competences – they can use management system through Emotional intelligence. Management through Emotional Intelligence improves leadership effectiveness, retains key employees, motivates personnel, enhances productivity and fosters organizational climate. Antonina combines her professional activity with scientific knowledge and practical skills of an expert on organizational, personal and business effectiveness. She is happy when meets interesting people during the group dynamic training’s that leads as a trainer. She helps them how to manage their personal emotional investment. Antonina is a member of the Board of the Bulgarian Association for Training and Development / BATD /. As a lecturer at the New Bulgarian University, she has the chance to discuss interesting and challenging questions with the students in the fields of psychology and coaching. She loves her clients in therapeutic and coaching practice and supports them to realize their personality in the way to achieve their goals! As the author of several books she communicates with the book readers about the psychology of parents family systems, upbringing and human emotions. Antonina always finds the meaning of things in knowledge, communication and human values!